This story was different in that it starts off as a reflection in 1977, of a past several years prior – that is a while ago. Even then, the differences between the Amish & English were great. It made me wonder how much more-so this is true now. The River * has so many truths imbedded – regardless of whether you are Amish, or an Englisher. No matter your upbringing. No matter your age – as daughters, we look to our fathers for acceptance and approval. We look to our mothers too, but I think our fathers even more. I appreciated Beverly’s choice of the sisters to not turn their back on their faith, as much as the organized religion they were raised in. She showed how they still had very personal relationships with Jesus, relationships in the process of growing even in hardship. This story is truly timeless, all the relational issues portrayed are still the same today. Tilly and her sister had to trust they were making a right decision, even though it hurt to follow through and it was hard. 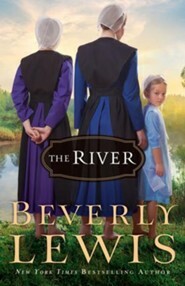 The River touched on family crisis, the resulting hurt, and leaving the Amish ways but not their faith in Christ. The realness of daughters searching for their father’s approval no matter what age you are, or the upbringing you’ve had, was hard. Throughout the book, you feel how difficult it is to repair relationships – even in “simpler” settings. Beverly has a way of writing about the hard stuff, but keeping each individual’s relationship with Christ as the focus, not their religion or the life choices they make. Joy has been a recurring theme today. Happiness does not just happen. It’s not something we can sit around and wait to receive. It’s not automatic – we have to work for it. Joy requires my openness and being willing to receive. We have to make a choice – everyday. God wants me to be joyful, I have definitely been one who got stuck thinking life was to be endured. Holley talks about the myths we believe and what hold us back from experiencing joy & happiness. You definitely should get the book and read it. Second, when reading emails later in the day… Bonnie Gray [Faith Barista, author of Finding Spiritual Whitespace *], posted about not being a brand, but being beloved. She started her post with a quote from Henri Nouwen – it was almost the same as what I’d read in Holley’s book, except it used the word ‘joy’. Consider it all joy when facing trials of many kinds. – He expects it to be a deliberate choice. I am not failing Him by having to choose daily. His grace is enough, it is all you need. – His grace truly does makes everything look different! His power is stronger in your weakness. – I have the privilege of leaning on His power, NOT mine. My weakness shows Him off even more. I fulfill my purpose of bringing Him glory by my weakness and His power being revealed. Oh, I am so thankful I am forgiven as often as I am. By Jesus’ blood, my joy has already been paid for. It is a gift. Like His gift of grace. From my Father, by the blood of Jesus, to cover me. The last several days the flu has been more present than not in my body. I’ve felt awful. I’ve slept lots. I’m ready for bed now and it’s only 9:30pm… and I and a 3 hour nap! I start to stress at times like this, I feel the pressure to be doing something to earn an income. He knows my plans, and I constantly pray He guides my daily activities, even when that means “messing” with my plans. I did get the desk and shelf put together and my living room all put together. and I love it! We have living room space again. :-) Pictures will be coming, but I started to feel too icky to continue, then I slept thru church, then my 2 came home from their retreat and now? – it’s not as clean as it was for the hours they were gone & I was sick :-D.
God had a plan in mind for YOU long ago. No matter what you have done – good or bad. No matter what you might do – good or bad. No matter what you might think about doing – good or bad. He has a plan. You can do the good things He planned for you long ago. No matter what your weekend has looked like. No matter what the week ahead holds in store. You are God’s masterpiece, His creation, made for one purpose – to bring Him glory. I encourage you to not get caught up, or tripped up, in doing today. He made you new in Christ Jesus. He loves you – no matter what.